Yesterday I made Coconut Crunch Cookies, a recipe I found at Taste of Home. They are crispy on the edges but soft in the middle--yummy! I had to make a few changes in the recipe for our family but they turned out great. Click HERE for the recipe! Tomorrow will be the letter P! See you then! Just dropped in on the blog-hop - hope you enjoy the rest of A-Z! A double oven would be nice but we just don't have the room for it. Enjoy your new range when you get it! I am so envious of your propane/gas oven. It would have cost us a small fortune to put in the vents for one in this house. The cookies look yummy. 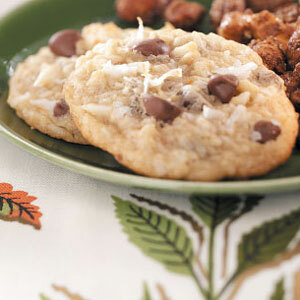 My coconut loving hubby and son would love them (I am not a coconut fan). Looking forward ot your "P" post, as I am sure it will be perfect. Living off-grid, it is pretty important to use gas when we can. I do love it! You will have to try this recipe for your fellas as it is super yummy! My P post will be Paper Crafts, of course! Thanks! I love it! I enjoy cooking with gas; I get impatient with electric stoves after using gas. Gosh those cookies look good. I don't really ever use my oven. I know, I'm terrible. I have actually never used the oven itself (it was new maybe a year ago), but I do use the hotplates on top. Soon moving house & will have a brand new oven to play with. I think I may actually use it. What a beautiful clean oven! I should be inspired to clean mine. The bread and the cookies look delicious too! I'll have to try some of these recipes. Thanks for sharing!